Here is another little Steampunk project I've put together to compliment my first Instructable. This is the delicate little sister of the Admiral's Sidearm I posted a couple of weeks ago. Very similar in style, and construction, this is a dainty little prop for the lady in your life. As you'll see from the photos this is a tiny piece, designed to be concealed on the leg in a Garter. I wanted this to be a very feminine design, to appeal to the Steampunk Time Travelling Adventuress! The name "The Bunny" comes from the twin "hammers" and adds to the "cutsie" nature of the project. It's a tricky thing to try and plan a project that's made from, on the whole, found objects. To try and find continuity between elements and the right sense of scale and style can take a very long time, sometimes however, the whole thing fits together first time. This little project was planned mainly around the brass vase I used as the barrels. I found a little image of an old "Garter" pistol, and used this to try and scale the pistol to fit with the candlestick trigger and barrel. The photo shows my quick concept sketch and the main pieces before I started construction. The upper barrel as it's layed out in the photo wasn't used in the end. It's important to be flexible with ideas, designs need to be able to evolve. I started by trimming off the flared base of the slim vase, I then cut it in half to make the two barrels. I then cut the basic shape of the wooden body from Walnut. The next thing to do was to drill out the two holes into which the twin barrels would fit. Once this was done, it was a case of finishing the shaping of the body, then polishing it. Again, the construction of the handle and the grip is very similar to my last instructable. I shaped the handle from more Walnut, then cut smaller shapes from some cork sheet. These were then covered with thin garment leather. I then cut/chiseled/dremeled a recess into the handle which I then sank the grips into. The small brass buttons that I've set into the middle of the grip have a tiny rendering of the British Royal coat of arms. I came across these just as I was designing this little pistol and knew they would work perfectly. I'll be honest, I can't really think of a reason why a steampunk garter pistol would every have our Royal coat of arms on it, but that's the beauty of making things that fit into a history that never was or a present that can never be! Once the handle and grip were completed I gave it a polish and a coat of wax then attached it to the main body with a dowel. The trigger is the piece of a carrying candlestick that your thumb goes through. Most of the candle holders I find like this are mass produced, ugly pieces, this one was a particularly cheap and nasty one that looked like it had been thrown through a production line. As a consequence the trigger looked pretty dreadful, a sharp contrast to the high shine of the barrels. So I spent a little time polishing it so it looked more appropriate to the piece. Once it was ready, I secured it into the body of the pistol. This trigger is stationary, it does not move like the last pistol did. The main reason for this was the current lack of a suitable spring! Step 5: &quot;Hammers&quot; and a Few Extras.. The next thing to do was fit the "hammers" I guessed that two barrels required two hammers. I'm not certain that is accurate (! ), but either way, the theory fits the design and I think that the twin "bunny ear" hammers are a pretty important part of the look. The next stage is when the pistol gets a little further embellishment, a decorative brass arrow, and adjustment knob and a little sight etc. Here are the final shots of the finished piece. Oh, that's perfect! I just sent a link of this to a friend of mine who's been looking for something to go with her steampunk costume. Thats some great work there, I love the shape of the main body. The only thing I would change in making my own, is to make the handle longer, but not lower, so the handle would basically be more angled, and go back further. Like Mal's gun from firefly. i'm building a sortof revolver flintlock, the stock is made of wood, the revolver drum is a weed grinder, which a gave a better purpose, i will have to fabricate my hammer and trigger out of steel, do you have advises on how to make it really jump out amidst a steampunk group? this looks really great, do you use tabletop sanding machines? In older style guns with barrels, two hammers were often used. However, I have personally never seen anything smaller than a shotgun with two hammers. (But I am not an expert in the art of firearms! Feel free to correct me.) 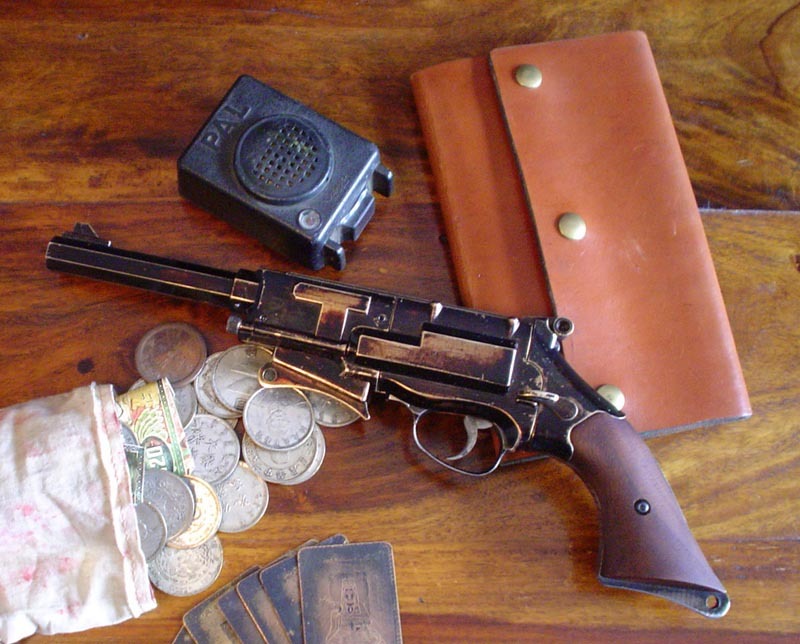 ANYway, steampunk is so alternate universe, I'm sure you could get away with a three-barreled, three-hammered derringer without a squeak. Anyone arguing for historical accuracy in a steampunk ensemble is arguing a moot point. i also have never seen anything other than a double barrel shotgun with two hammers. however those are almost always flintlock guns from the 18th century, due to the fact that the projectile was a muzzle loaded ball and not a shell. (basically each shot/gunpowder charge and projectile/ball needed its own barrel. if you come to birmingam england, there is a museum called the 'think tank' and there, there are several tri-barreled pistols. If I'm ever in that area I'll be sure to check it out! Do you know what they were called, so I can Wikipedia it? I love adding to my trove of diverse knowledge. Does this shoot anything and/or work? Victorian PeaShooter! Dude, that rocks!!!!!!!!!!! I'm a wood lover, and i feel like its a shame to hide that pretty burl behind the leather. other than that, I love the way you set up your components! Reminds me of a luger. is this a real gun?